State lawmakers plan legislation in support of green schools.. Legislators gathered at a green school in Cambridge, Massachusetts, with the Center for Green Schools. Early in August, the National Caucus of Environmental Legislators hosted their annual meeting in Boston, where state lawmakers discuss the most pressing issues in environmental policy and make commitments for their coming legislative sessions. Each year at the caucus meeting, the Center for Green Schools at USGBC holds a workshop to review the latest in green schools research and policy and make an action plan. 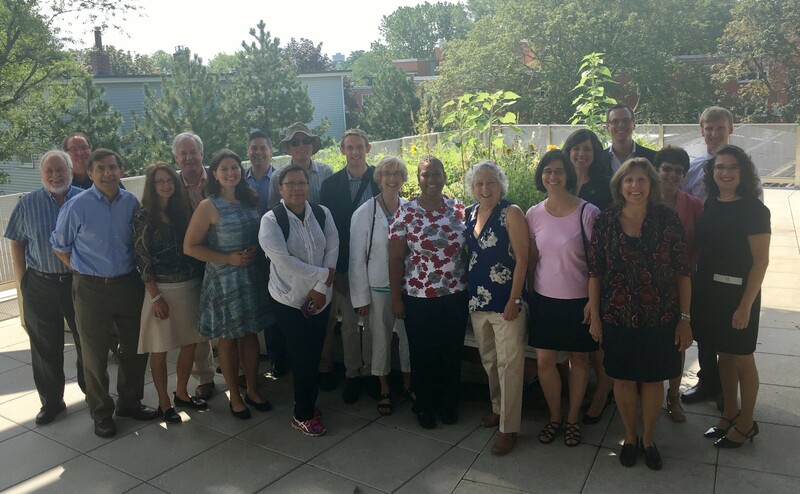 A dozen legislators from around the country joined us in a morning tour of the beautiful Martin Luther King, Jr. School in Cambridge, Massachusetts, which was recently built with aspirations of net zero energy and seeks to achieve LEED Platinum. Visitors met with the architects from Perkins Eastman, the former mayor of Cambridge and city energy staff to learn about the policy landscape and motivations behind the green school. They also learned more about the school’s features—including an extensive learning garden, lesson-friendly mechanical room, and an indoor/outdoor gym. School infrastructure financing and management: The group discussed recommendations for local, state and federal action from a 60-person working group of national experts on school financing and management, including implications for state-level policy making to give school districts what they need to operate healthy and efficient buildings. Energy efficiency in existing schools: A soon-to-be-released policy overview from the Center for Green Schools was reviewed. The overview covers state laws in eight states that provide funding mechanisms for energy efficiency projects in existing schools. Benchmarking: The group examined current best practices for benchmarking energy, water and other sustainability metrics on the local and state level, including examples of existing state-level and local policies. Green infrastructure: A preview was given to a forthcoming study that builds on the 2016 Achieving Urban Resilience, as well as policy implications for more sustainable land and infrastructure management. New research on the sustainability and health opportunities of so-called “smart surfaces” was also addressed. Each year, the Center for Green Schools follows up with state legislators to ensure they have the resources they need to advance their priorities on green schools and green buildings. View our menu of options for state legislators, and pick out what you think is most important to take to your elected officials. After many years of working with legislators, we have learned that your voice, as a constituent, is the one they value most. Posted in News and Events | Comments Off on State lawmakers plan legislation in support of green schools.. When it comes to sustainability, data is ushering in a new era of green performance. Thanks to the digital age, our ability to capture data are virtually limitless, and the information we gather has the ability to drive better decisions—economically, socially and environmentally. Over the last two decades, USGBC and GBCI have gathered vast amounts of green building data through transformative tools such as LEED. Recognizing the critical role data is playing, GBCI created Arc, a digital platform that is helping buildings, communities, and cities around the world benchmark and improves green performance. Comparison: Comparing performance leads to better results for everyone. Data is a powerful motivator and allows us all to learn from one another’s successes and shortcomings. Projects on Arc can see how their efforts are working and how they stack up to similar projects locally, regionally and globally. Collaborative Learning: Projects pursuing multiple sustainability efforts at once—energy, water, waste, transportation and human experience—make better decisions when data is shared across teams. Arc connects actions so that buildings, communities, and cities can ensure they are performing at the highest possible levels. It also integrates with Energy Star’s Portfolio Manager and other industry tools to drive even greater results. Performance beyond buildings: Data allows us to see results. Results are the core of performance. In Arc, net zero performance in energy and water is shown through a perfect score. Data also allows us to be non-linear. So we don’t have to separate buildings from communities and cities. With Arc, users can look at the performance of buildings, neighborhoods, districts, cities and more. TALLAHASSEE – The Florida Green Building Coalition (FGBC) has recently announced winners of its annual Green Achievement Awards. The competitive awards, based on green certification scores, recognize residential, commercial, high-rise residential, and land development projects, as well as, local governments for exceptional sustainability achievements in a number of categories, such as energy efficiency, water conservation, indoor air quality, site preservation, resource (materials) efficiency, and durability. The local government program criteria evaluates energy and water usage, air quality, health issues, land use, recycling and waste disposal, maintenance policies, educational programs, purchasing practices, and regulatory policies. It is designed to help protect and conserve the community’s natural resources, enhance the efficiency of government, thus reducing the cost to taxpayers, and raise public awareness about the benefits of environmental stewardship.